Just had an outing yesterday at Cherai beach, Paravoor. The beach is so amazing and romantic. You can occasionally spot Dolphins here. From the road side sellers there, we purchased around 1 kg of Kakka / clams. Though I have taken Kakka irachi fry from hotels, and my home I haven’t prepared it myself before. Here is my mothers recipe for preparing this kakka thoran. This goes well with rice and Pulissery. Clean the Kakka / clam thoroughly by pinching it laterally. Force out the greyish-black grit found inside each of them. Wash it in plenty of running water to remove any dirt and grit and finally squeeze the clams to remove water. Into a pressure cooker with out weight add the Kakka, sliced shallots, salt, Turmeric powder, Chilly powder, garam masala powder, black pepper powder, coconut and water. Cook it for 15 minutes with lids closed. In the mean time, in a pan add coconut oil crushed garlic, crushed ginger, curry leaves and saute till the aroma goes. After 15 minutes put the weight over the cooker, and cook for 2 more whistles. Turn off the flame and allow the steam to go out of the cooker. Transfer the clams into the pan and saute in between in medium flame. Cover it with the lid. Add coconut oil as needed and saute in between, to make the mix dry. Serve with rice , Idiyappam or appam. Don’t compromise on black pepper powders. That’s the one making it spicy. On step 6 if there is water remaining in cooker, transfer that too into the pan and saute in medium flame. 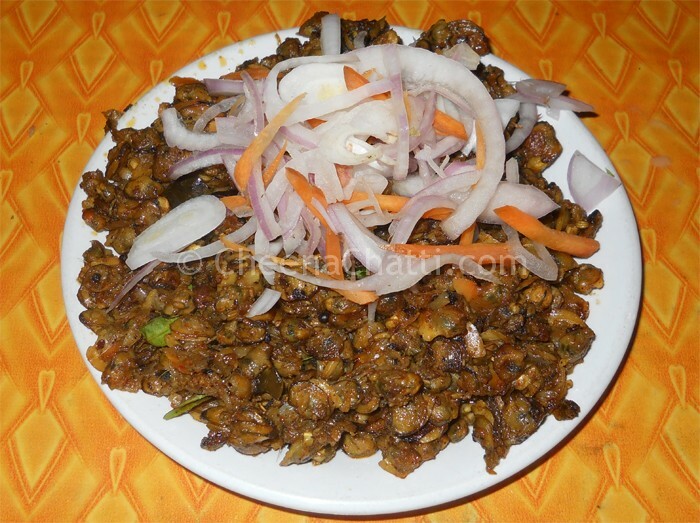 This entry was added on April 20th, 2013 by Renoos in Non Veg and tagged with kerala kakka recipes, kakka irachi recipe, clam, kakka irachi ularthiyath, kerala curry, kakka erachi curry, kakka erachi thoran, clams recipes, clam fry curry. Last revised on March 29th, 2018.
thanks dear. great. very useful. I could made it very tasty though I am making it for first time. Making kakka irachy fry please help me.